For nine days in March every year, Canberrans awake to the magic of a flotilla of hot air balloons drifting gently across the city skies. It’s something we’ve been witnessing for more than 30 years, but it’s a sight that never grows old. The Canberra Balloon Spectacular, originally held in 1988 as a one-off, is now firmly embedded as part of the two week long Enlighten Festival, when the nation’s capital literally lights up in celebration of our birthday. That’s a solid party! This year the festival takes place between 9-17 March. 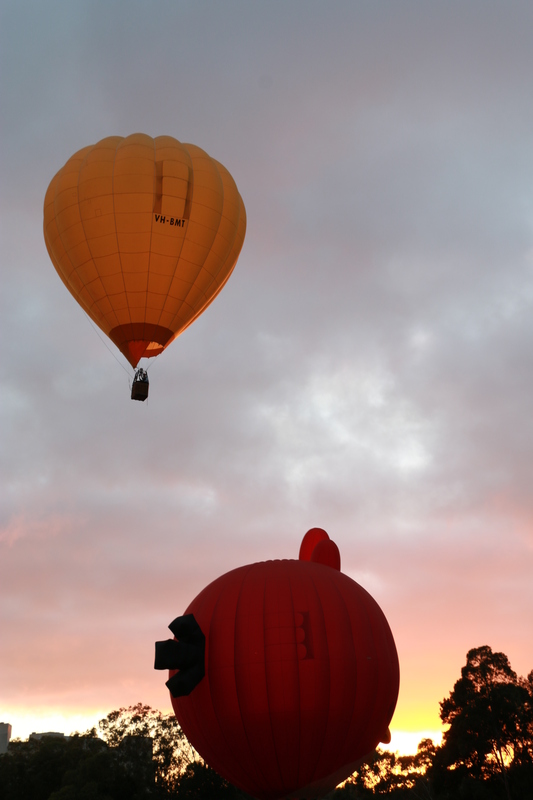 More than 30 giant balloons in all colours and shapes launch from the lawns of Old Parliament House, just as dawn breaks. The mornings are still and just-chilled, but there’s live music and hot breakfasts on the side. To help you make the most of the festival, the biggest of its kind in Australia, here are a few tips. Ballooning totally depends on the weather, and weather can be fickle, so daily launches aren’t guaranteed. To avoid disappointment (and complaining kids), check updates before you leave home. You can follow Enlighten on Facebook, visit its website, tune into local radio or call Canberra Connect—and possibly save yourself a wasted trip. Although, even if the balloons don’t fly, breakfast’s still on. If you’re keen to catch a balloon sighting or two, go at the beginning of the festival. If flights are cancelled, you’ll have more opportunities during the rest of the week. 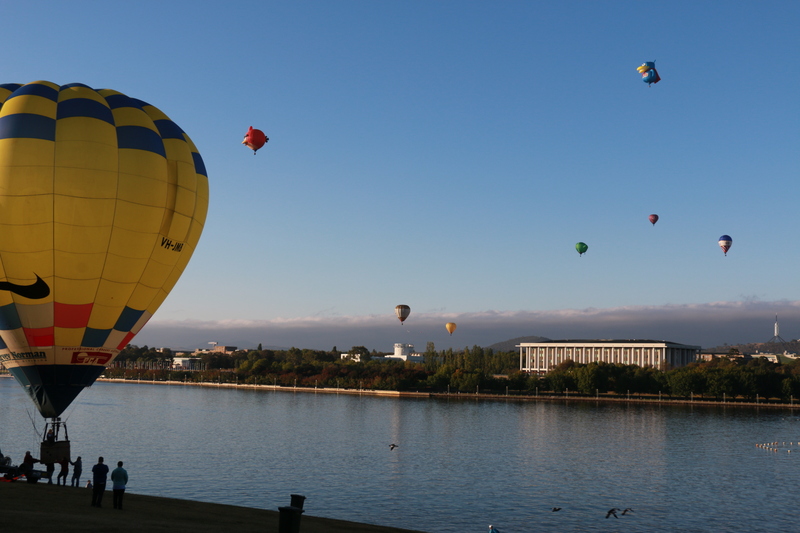 The balloons start filling from 6.15am on the lawns of Old Parliament House, taking around 15 minutes to fill and lift. Most have floated off by around 7am. This is where the action starts and it’s a buzz watching the balloons being fired up. If you’re running late or just want to watch the balloons floating across the city, pick another location. The flight paths vary with the wind, but they often head north-westish across the city. Arriving early for take-off lets you get up close and personal and witness the balloons come to life. You’re part of the atmosphere, surrounded by the swoosh of the gas cylinders and the heat of the flames, the riders in the baskets, and hundreds of early risers. It’s a bit of a party atmosphere with live music on the weekends and hot breakfasts available each day from the Belconnen Lions Club. You can grab pancakes, burritos and juice, and of course there’s always coffee. Even though March days in the capital are mainly beautiful, it is Canberra remember, and the mornings can be surprisingly chilly and the grass damp. Wear closed in shoes and bring a jacket. from the heights of the arboretum as the sun rises. The Balloon Spectacular is a photographer’s true delight, as the hundreds of thousands of shots taken every year attest, but you don’t have to have the best gear to get a great shot. If you want to increase your chances of nailing something really special, don’t fret—I’ve got you covered with tips for photographing Canberra’s balloon spectacular. Anyone can get amazing shots. 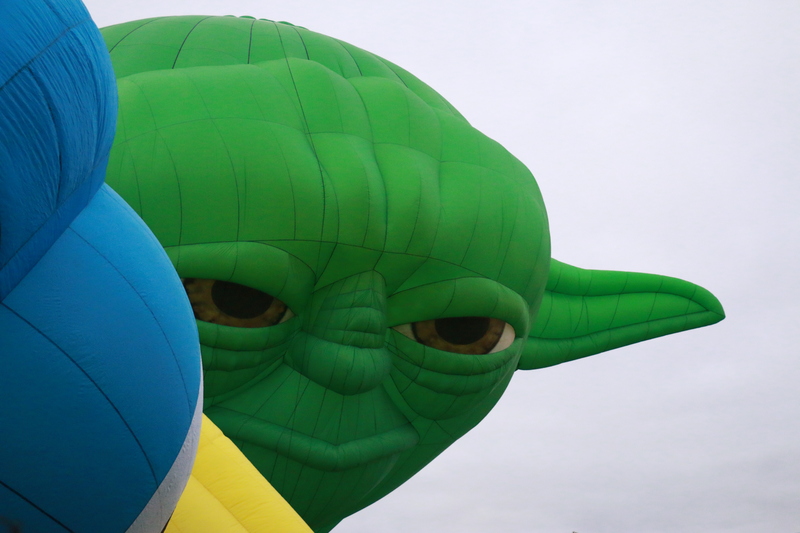 The balloons come from all over the globe and each year brings a couple of new characters to the skies. In past years we’ve had an angry bird, Kerbie the frog, a Scottish bagpiper, Simba, Yoda and Vincent Van Gough. And who could forget the controversial Sky Whale, commissioned for Canberra’s anniversary with its rather distinct, umm, mammary glands? Who will it be this year? They’re not cheap those special balloons, costing around $200,000 to make one. For a real treat, you can take to the skies yourself in one of the balloons. 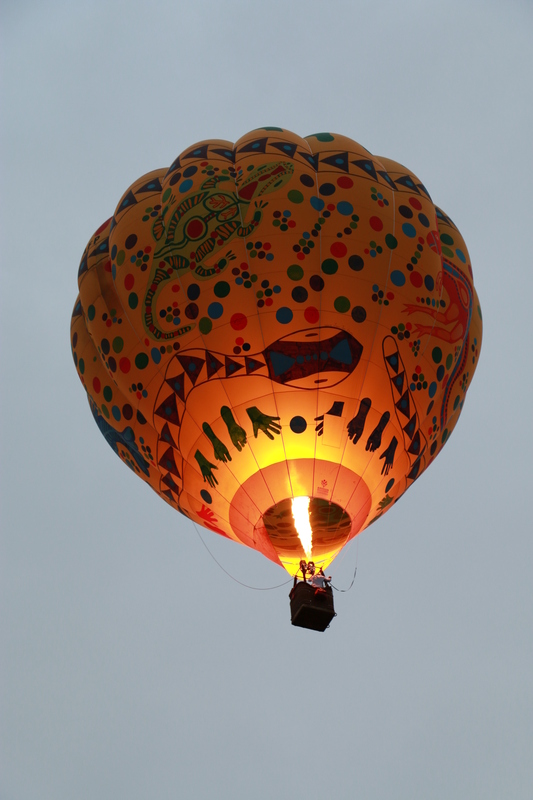 Both Balloons Aloft and Dawn Drifters offer paid balloon rides during the festival. To get a really unique perspective, you could hit the lake waters instead on a guided kayak tour with Canberra Urban Adventures. The balloons often get very close to the water as the balloon operators like to show their talent by seeing if they skim along the top. This year will be your last chance on a kayak tour as sadly they won’t around much longer. Set your alarm, Canberra, and don’t miss this spectacle. It’s totally worth getting out of bed for, and that’s coming from someone who doesn’t like rising before 8. Maybe leave your pooches at home though, as some get quite sketched out by those gas swooshes and looming shapes. This article was first published in HerCanberra. This is just one of the reasons I love living in Canberra so much. This. For our birthday, every year. I’m a amateur, trying-very-hard photographer, trying very hard to capture some great images of Canberra’s wonderful Balloon Spectacular. It’s more difficult than one might think. I am in awe of those stunning postcard shots on official websites and splattered elsewhere in cyber land, with perfect lighting and framing and timing. Those beautiful images are way harder to capture than I’d imagined, and can be downright elusive. 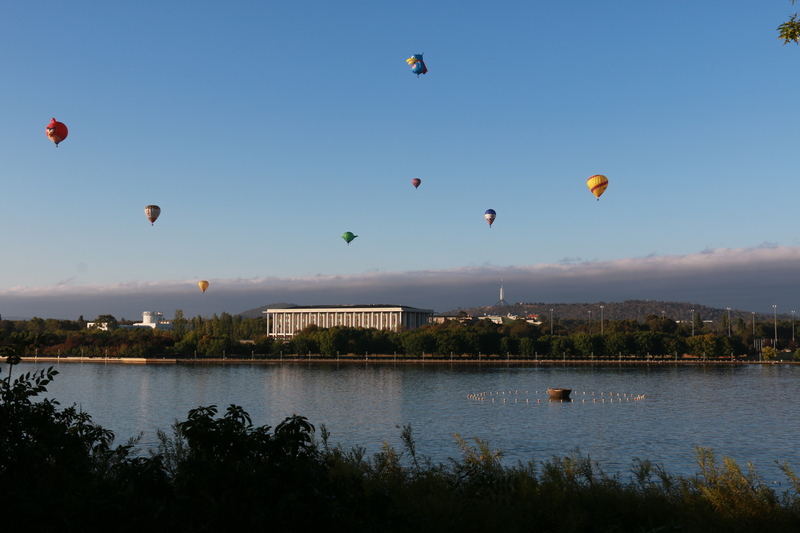 But if you’re keen to photograph this wonderful morning awakening on a just-chilled Canberra morning as the balloons float across the dawn skies in a graceful flotilla, here are some tips to help you score some great shots. 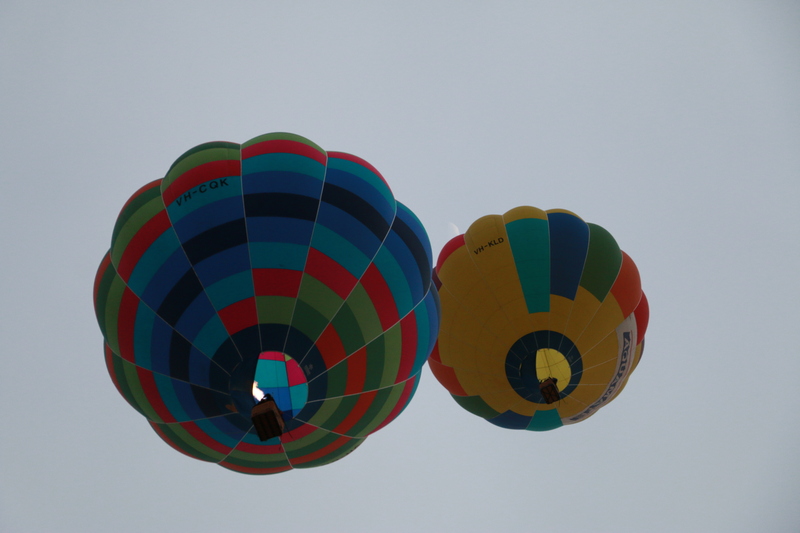 Rule number 1 – balloon flying is dependent on the weather. Rain, too much wind, not enough wind, rain … the balloons don’t go up. Forewarn the kids the night before if you’re taking them to allay potential disappointment, and check on the weather before you set out. 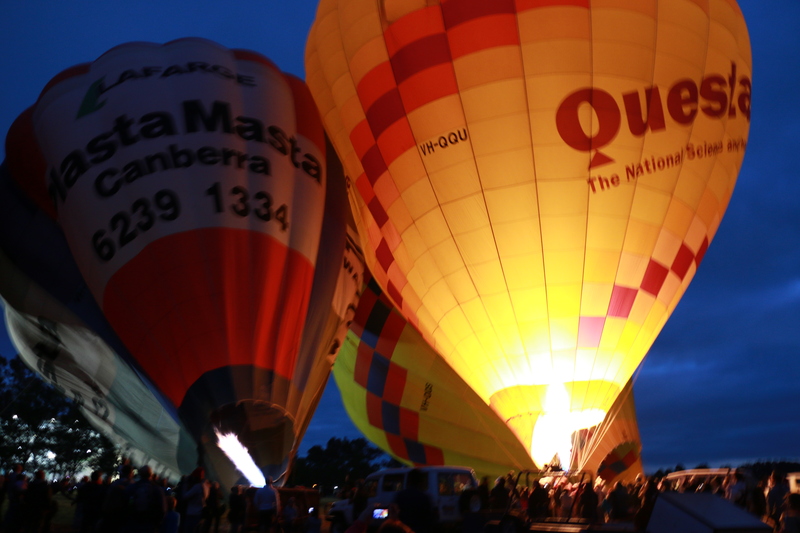 You can call Canberra Connect on 13 22 81 or follow the Balloon Spectacular or EventsACT on Facebook or Twitter, or listen to your local radio station. If you just turn up hoping and the balloons don’t fly, make the most of the morning anyway to witness the city coming to life as the light comes up over the lake, the rowers and the cyclists appear. Or stay for breakfast in the tents on the lawns. If you want to witness the crews at work and the balloons emerging from the ground and rising, get there around 6am to scout locations and find the action. The balloons start filling just after 6am, start taking off around 6.15am and most are in the air by 7am. The whoosh of the fiery shots into the balloon and the revelation of the balloon shapes are not to be missed. 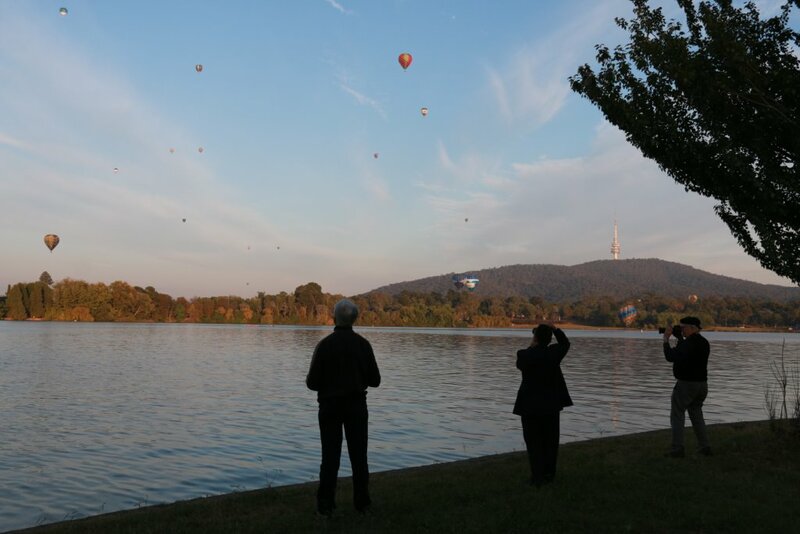 Even if you are late, when the sun is up and the balloons are on their way, it’s still a spectacle to watch the balloons on their cruise around the city skies, drifting close to Parliament House or hovering above the water. The light changes quickly so if you are using an SLR camera you will have to adapt accordingly. Start with a higher ISO in the early morning and drop this as more light appears. Keep an eye on your light metre to guide you. Turn off your flash in the early morning if you’re using a point and shoot or a phone – the automatic function will perceive it as being too dark and will want to flash – only useful to light up a couple of metres in front of you which is probably not what you are aiming to shoot. Avoid shots where there is part shade and part sun. Make sure you have an extra card and battery, just in case, and a different lens for options if you have one. Or spare film if you use – does anyone use it anymore?? And perhaps a tripod in the car just in case the balloons don’t fly and you want to concentrate on the dawn lights, or you want to be extra steady. Look for something a bit different. Get down low, or stand on something to give you more height. Try taking shots directly upwards, or downwards, from different angles. A sea of spotted balloons across a sweeping sky is impressive, but so is a close up of just one or two. If you want to start with the excitement of the balloons filling and lifting, you will need to be at the lawns in front of Old Parliament House. As the balloons move on, you can change location to give you a different perspective. Try crossing Commonwealth Bridge and parking next to the lake overlooking the Museum and Black Mountain, or under Commonwealth Bridge, on top of Kings Avenue Bridge, near Regatta Point, on a boat on the lake to get up super close – there are lots of options. From the lake at the end of Anzac Parade or near the Carillion you’ll get a lovely wide shot vista of the lake with Library, bridge and Black Mountain in the background as the balloons drift away, sun behind you. 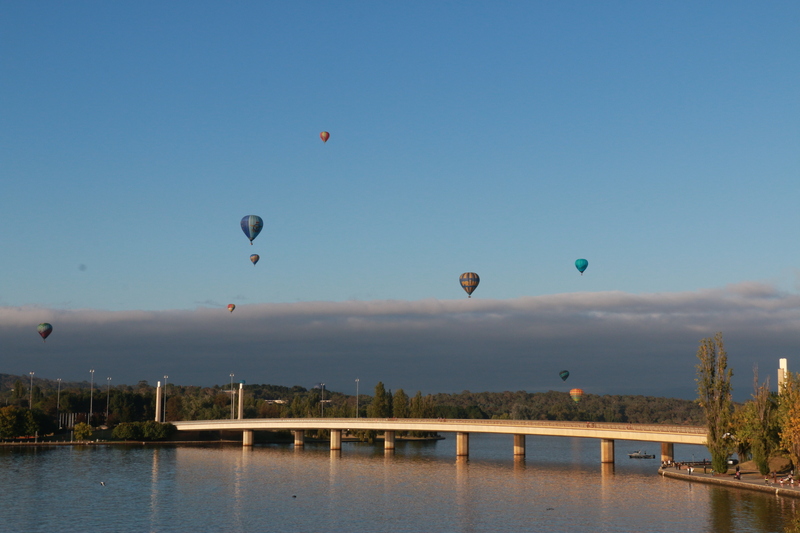 If the balloons take off from near the Arboretum due to weather, watching from around Scrivener Dam is a good option. It’s all about the balloons, but pay attention to what else is around. 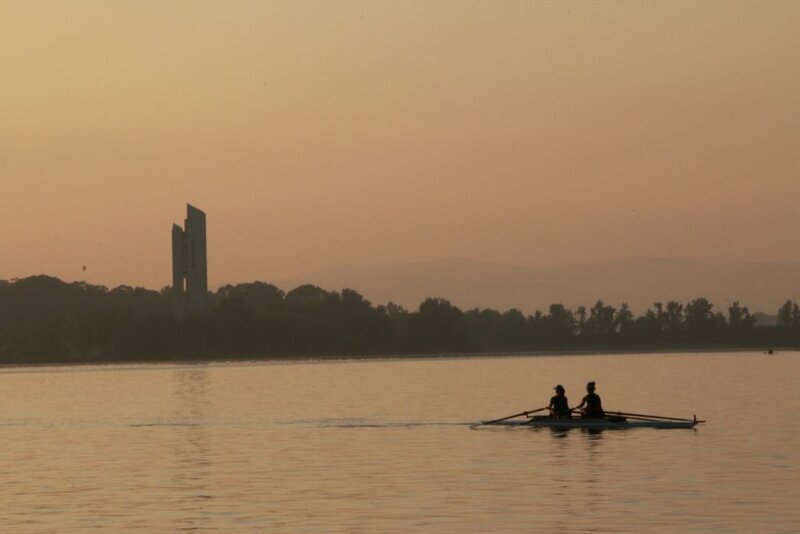 Of course, the lake and Canberra’s iconic landmarks, but look out for the birds, the rowers, the foreground, and the crowds. Fellow spectators can also be great subjects. Watch around you. The scenes and skies are constantly changing. A great shot might be right behind you. Watching out for balloons landing is another option. The Balloon Spectacular is a moving feast with a constantly changing canvas. Watch for patterns of balloons in the sky or interesting positions, and wait until balloons move into a favourable position before you press the shutter. Try to anticipate what’s coming up and wait for the right second to press the shutter. For example, wait until the fire is released into the balloon for a shot of light, or wait till the animal balloon faces are nearly touching so it looks like they’re kissing. Pay attention to what’s in the background. If you’re taking photos around the lake near cycle paths, spare a thought to cyclists. Don’t stand on the paths to get a great photo, oblivious to users. I’ve seen a number of cyclists having to evade unaware spectators, or their protruding tripods. Keep trying. If you want really great shots, you may have to put the time in to get all the conditions right – cloud, colour in the sky, balloon formation, vantage point, timing, control of your camera, etc. And if you don’t get great shots this time, there’s always next year. Have you got any other tips? I’d love to hear them.